Not many dogs in this area. Very little dog poo. In fact I started to wonder if dogs live here at all. 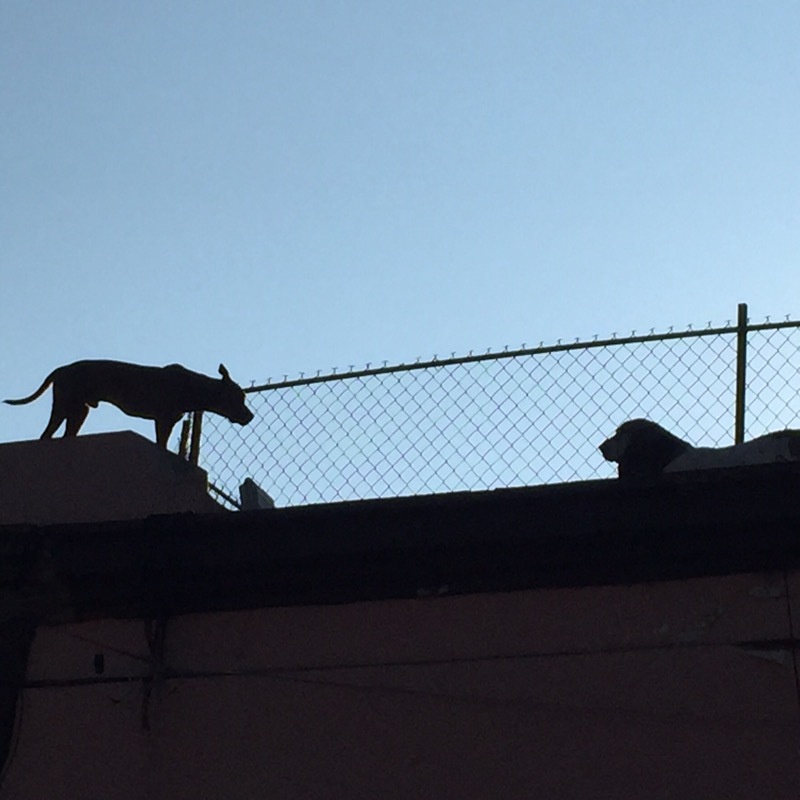 When I saw dogs on the roof of a nearby building I figured most are kept in the houses and courtyards and presumably walked in the parks. I’ve seen a few, not many. Yes, the situation is very different in the surrounding suburbs. Yes, more on plumbing after the well and toilet paper last time: I was concerned the shower was stuffed and was mentally composing an email for Marie Antonio. Tested and tried one more knob (the shower has 4 plus a selector). Yes the water volume returned to normal! Thankfully. In a conversation in class on Tuesday we discussed a language interchange to improve my skills and those of someone else in english. One of my teachers also teaches english and will see what he can do. So. Should be for a couple of days a week. If I get a taker we can do it in a cafe or whatever. In the meantime I practise on whoever: Maria Antonio, the woman from whom I often buy cut up pomelos or mangoes, the shop keeper etc. All victims of my Spanglish. Marco commended my Spanish vocab and I reaffirmed that what I really need is to practice listening and speaking. We did a great exercise that morning. I had to read an unseen piece out loud and then I was to silently read it and ask him any words I didn’t know. Then I had to answer questions aloud. Was very helpful as it was a very different topic from the usual, a self indulgent excerpt from the South American literature. Now, if I could speak the language and understand better…. Maybe I need to return here for a few weeks and to forget more school in Spain. What an exquisite dilemma! Better to stay in Oaxaca for longer this time I suspect. And yes, I’ve mentioned it to Mary-Jane and it’s possible as my room is not booked until 19th October. 😄 Yes, I am enjoying school here, I like where I live and, the pool and gym. So. Notice how my comments on school seemed more positive after the last blog? I don’t understand why but a ‘bad’ class is often followed by a good one. Not the teachers that make it bad but me. For some reason I couldn’t find words on Monday. Yes, probably because I’d not used enough Spanish over the weekend. However today followed classes yesterday plus, I had written a lot as homework for Alfonso and we went over that. Then I changed teachers. Happens most days and I like the change. I’m sure the teachers prefer it too. By tomorrow I should be scratching mosquito bites all over. This is despite a considerable amount of insecticide! I was trying to set up Mary-Jane’s wifi extender. Yes, some self interest is implicit. I was so involved in sorting out the problems that I didn’t notice the mosquitos. Thankfully Maria Antonio was still there and had insecticide or the damage may have been worse. And before you ask, I haven’t got the system to work yet. Yet… Guess what I’m doing (again) after school tomorrow? Yes, cementing my relationship with a dlink again. Again. And yes, I was successful. I can now download from anywhere in my apartment. Not always fast but it works, unlike the prepaid internet I have. Or possibly have. For some reason I can’t download any more but I’ve used lots less than 2Gb and it’s been less than 30 days. I don’t understand but suspect I have many minutes of calls available but the data has run out. Aggghhhh. And, finally, I have a radio! I was unable to buy one in Oaxaca despite visiting many shops. And yes, iPhone has an FM receiver chip but it’s nonfunctional. I discovered they have some FM radios here, where I’m staying. Hooray. So now I can listen to local stations any time I’m home. ☺️ Go to sleep with it and wake to it!!! Just like home but with a lap pool. I was hoping that on Friday that my lesson would be a trip to some nearby towns. Didn’t know how it works. Guess I pay for a taxi or bus fares and a teacher and I go to places. I want to visit the workshops for the small painted wooden items, a market and a orchid place. The trip is tomorrow, with 1 teacher, and to the orchid place. Apparently the other places are in the opposite direction. Anyhow, it’s not a tourist town and so that’s also good. More tomorrow. After. I’m looking forward to it. Seems like a naughty day off. 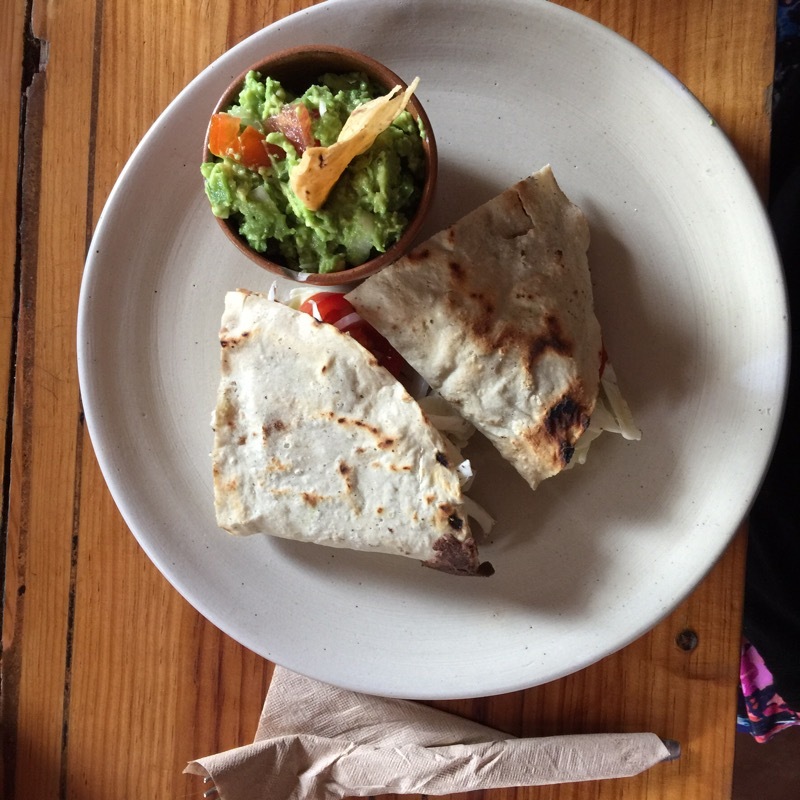 A tlayuda – local dish more like our tacos: soft maize out containing meat, cheese, tomato and onion with guacamole on the side. Great. And yes, the guacamole contained a lot of chile and was what I wanted. Very nice. The day after the tlayudas were dry and with no cheese. They’ve lost a customer. Pity as it’s convenient for brunch straight after school. Was coming to Mexico a good idea? Yes, undoubtedly. September is the month in which this war of independence is celebrated. Flags and other patriotic objects starred appearing on the streets mere days after I arrived. 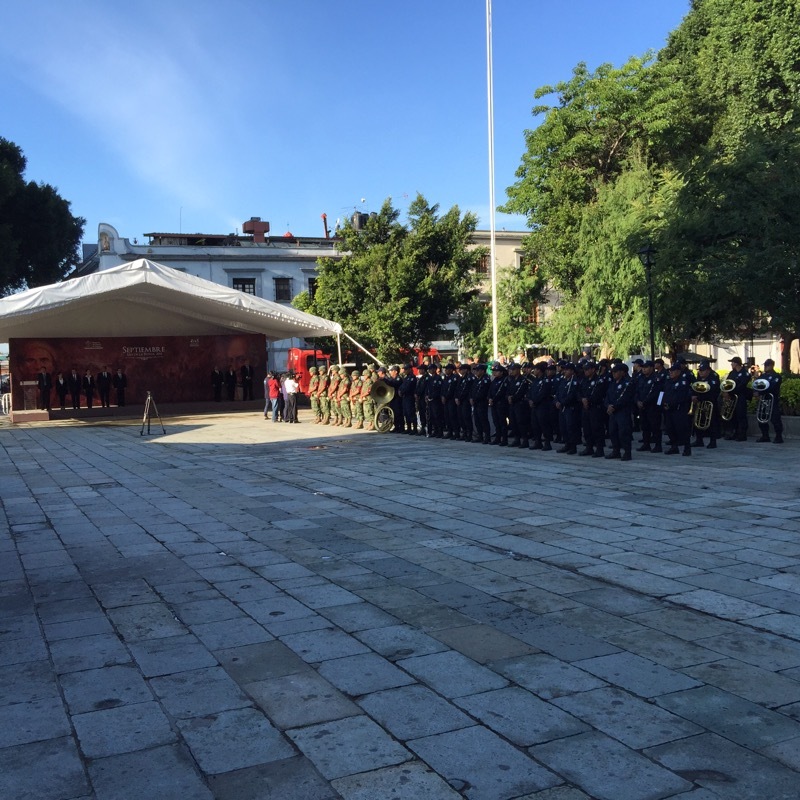 However, this morning I lucked into an official raising of the flag in the Zocálo. Attended by many police and a few army guys it was watched very seriously by those locals present, in lines opposite the forces. Local officials were lined up on a stage down one end between the locals and those in the forces. They started giving brief speeches just as I had to go. I didn’t want to be late for school, forgoing the nationalistic rev up that was starting. The cornets (Spanish name), are like trumpets without buttons and, sound great. Very discordant, and when they are played the difficulties in getting the required note are are obvious. A group of them? Well, yes, more discordant and yet obviously together. I love the sound and imagine them as the 14th or 15th century predecessor to trumpets. After the lone player the flag was formally raised. And then the army band with their cornets played, and then the police band. 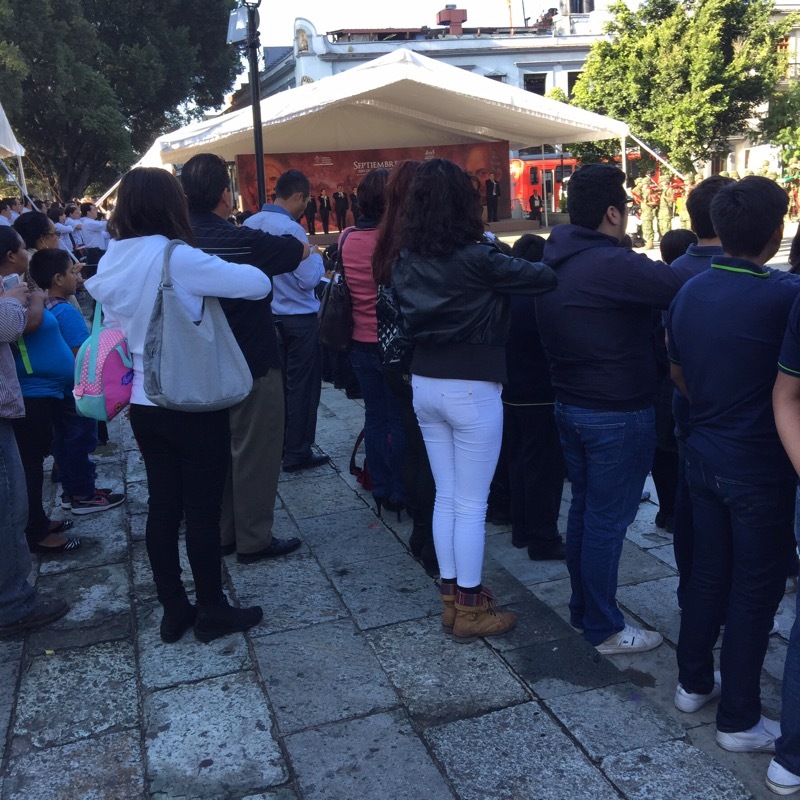 The biggest surprise was the way almost everyone present, many with a small Mexican flag in hand, crossed their right arm horizontally across their chest as a national song was played. Apparently flag raising ceremonies will happen in the Zocálo all this week. Good. TV is blaring in front of me. I changed over rapidly from a channel in which liars had to be identified. Now, it’s a Maori guy doing self survival in NZ somewhere. He was unable to kill the pig he disturbed. Yup, I was voting for the pig, a very agressive number. The guy has no knife or equivalent and is not doing well. Lucky for him it’s TV but, I admire ‘his’ Spanish. Yes, it’s dubbed. Whoops. Just looked up again and he has his eye on a seal. Given the trouble he’s having climbing the rocks my money is on the seals!